Heron. Nothing stirs up dread in a koi owner quite like that word. The Great Blue Heron, or ardea herodias as it’s known scientifically, is a scourge to fish lovers with outdoor ponds. South Florida and Keys koi keepers have the Great White Heron to worry about too. Heron are large birds (sometimes as big as 4ft high with a 6ft wingspan) and are extremely adaptable hunters. They are considered ambush predators, which means they hunt by sight and are incredibly patient. Heron will stand still or move slowly and methodically, wading from spot to spot and remaining motionless until one of your unsuspecting living jewels swims close enough to be caught. There really isn’t anywhere that a koi keeper with an outdoor pond is safe from heron. As one of the most widespread wading birds in North America, they are pretty much everywhere. Heron also are found in Central America and, in the winter months, they will head as far south as northern South America and the Caribbean. There can be some respite from marauding heron for koi keepers in the northern states whose ponds freeze over. Heron will migrate to warmer climes for the winter, skipping those bodies of water that prove too difficult to fish in. Sadly, developed areas (like suburban neighborhoods) don’t deter heron, especially if there’s a fish-bearing body of water nearby. Your koi pond is the perfect “fly-through” location for a heron to feed. Your pond is much smaller and shallower than the marshes, mangroves, and swamps heron usually hunt in, so heron can sit and wait for a meal to quite literally swim by. As your koi cannot swim beyond the confines of the pond, they are sitting ducks. A larger or deeper pond can help, but heron have been known to adapt their hunting techniques by dropping in on prey from above or hovering and diving. How Do I Know If I Have Been Visited By a Heron? Short of catching heron in the act of stalking your koi, It can be tough to identify when you’re dealing with this unwelcome visitor. Unlike other predators (such as otters), heron leave little trace of their attack—aside from your dwindling pond population. If you have smaller koi or goldfish, a heron can easily swallow your fish whole. They will even attempt the same with larger koi—sometimes choking as a result. Heron usually prefer to feed during the early morning hours and at dusk, but a meal is a meal and they will come at all hours to feed. 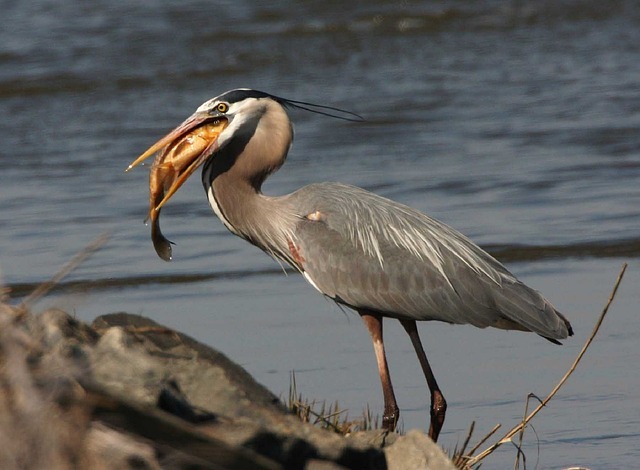 Heron can consume up to a pound of fish per day. While they aren’t quite as voracious (or messy) as otters, once a heron has earmarked your pond, it will come back as long as an easy meal is available. Heron tend to be creatures of habit. They will scout an area, checking to see if there are any potential feeding spots. They may not come down the first time, but if you see a heron overhead, you can be almost certain that it will pay your pond a visit at some point. It’s possible that you may find a koi in your pond that has suffered a heron attack but wasn’t eaten. If so, it will likely have a fairly substantial wound from being speared by the heron’s sharp beak. Koi can survive this type of attack with some special attention. Depending on the severity of the attack, you may have to move the wounded koi into a separate, smaller tank to monitor and treat it. The threat of secondary infection can be more dangerous than the wound itself. There are a number of techniques that koi keepers employ to keep these feathered thieves from their ponds’ door. As there is no one surefire method to dissuade a hungry heron (or equally determined koi predator), using many methods in tandem can sometimes swing the balance in a koi keeper’s favor. Here are some of the more successful means of heron deterrence. Heron, by and large, prefer to hunt in shallow waters (less than 2ft deep). However, as they are large birds and multi-faceted hunters, they can also fish in deeper water. A gentle slope on the sides of your pond can act as a slight deterrent for a hungry heron as they prefer to have secure footing to wade and feed. Thus, a graduated pond that slopes toward a deeper area can provide a little more protection for your koi. Shelves in a pond can be great for housing aquatic plants, but they also make for great vantage points for predators, so consider leaving the shelf out of the plans if you think you might be vulnerable to predators in your area. Aesthetically, netting is not the most pleasant way of keeping predators out of your pond, but they are one of the most effective and efficient means of keeping heron at bay. 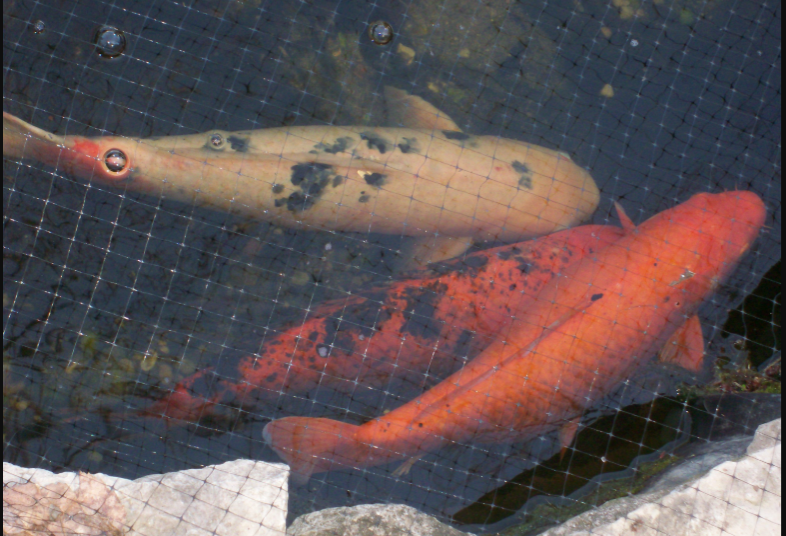 Nets also can have the dual purpose of keeping leaves out of your koi pond. Netting comes in many different shapes, sizes and colors. A tighter weave is more effective against herons as they cannot easily spear through it—although there are instances of heron trying to poke through the netting to spear a fish. Another deterrent similar to netting is to use fishing line criss crossed over the surface of the pond in a grid. It is less expensive than netting, less visually distracting and effective because heron will find it difficult to move. There are more than a few koi keepers who have come outside to find a heron tangled in the fishing line. As territorial birds, if one heron spots another around or in a body of water, it will generally move on and look for another feeding spot. Putting a fake (but pretty darn convincing!) plastic heron near your pond can be a deterrent. Of course, this is not a guarantee, but it can be a good place to start. During mating season, however, the decoy will not be fit for purpose—for obvious reasons that probably don’t need mentioning. In fact, it can have the opposite effect and act as a lure for other heron. Also, it is important to move the “heron” periodically. Heron are expert hunters and if they notice that it hasn’t moved they might investigate. Also, if a larger heron spots a smaller decoy, it might come down and muscle the smaller one out of its territory. It’s how nature works! If you have already had a visit from a heron, it’s too late to put up a decoy. As heron stake territories, once one has been to your pond, it will mark it as its own. You can use other types of decoys, too. The heron has its own predators, like bald eagles, bears and even raccoons. Some koi keepers will use life-size model coyotes to keep heron away. Some of these methods might not fit into the idea of your pond aesthetic or your general decor, but remember, if they help to keep heron away, they are worthwhile. We don’t mean your normal avian-averse stuffed dummy. Instead, you can install a specially designed motion-activated sprinkler that shoots out a spray of up to 35 ft. Like a traditional sprinkler, the blast of water can be preset to focus the water within a certain width. Anytime something comes within the ScareCrow’s sensor field, it will jet out a stream of water to give the offending beast a scare and drive it off. It can be used all season long and is somewhat inconspicuous. The ScareCrow also works on all manners of creatures that you might not want around your koi pond. It won’t recognize you, so you too will get a water blast if you step into its radius! Remember to change the location of the device periodically to keep predators guessing. Some koi enthusiasts have also used shining or reflective materials (like rainbow scare tape) to deter heron. It is used as a non-lethal means of keeping birds away from crops and is believed to be effective against heron, too. Some koi owners find it aesthetically pleasing, and others do not. As heron use their visual acuity to hunt, providing cover for your koi can prove invaluable for their safety. 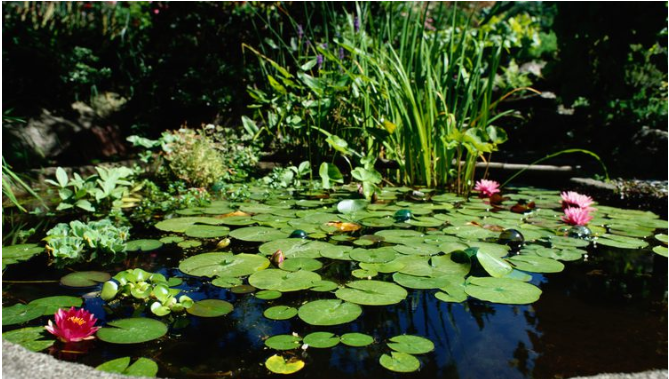 You are more likely to see a heron around your pond in late spring through summer, which is also the perfect time to have floating plants adorning the surface of your pond. These floating plants have the benefit of providing shade for your koi as well as helping to keep the pond water’s temperature lower to prevent algae blooms and low dissolved oxygen levels. Additionally, strategically placing some bushes around the edge of your pond (especially in the shallower edges where a heron is most likely to wade in) can slow a heron down or at least give it reason to pause. As part of your build, consider creating in-pond hiding spots, like caves or tunnels, as safe spaces for you koi to retreat to if they encounter a predator. If you don’t have them in your pond as part of the build, small sections of construction pipe or koi castles can be added later. Stay in touch with your local koi keeper groups. They can be an invaluable source of information and neighborhood watch all in one! If a heron is spotted in the area, they can sound the alarm and alert other koi and ornamental fish keepers to its presence. If you are thinking about taking the ultimate step to end a heron’s threat to your koi, don’t. The Migratory Bird Treaty Act of 1918 protects the heron, making it illegal to kill one. Vigilance is often the best tool against any predator, but with a little planning and a few wise investments, you can put up a good defense against an interested heron that is looking to use your pond as a snack shack.